OK, so maybe you aren't interested in making your own toys, cellphone cases, or glow-in-the-dark Christmas decorations. How about a brake drum? Until now, 3D printing has been a polymer affair, with most people in the maker community using the machines to make all manner of plastic consumer goods, from tent stakes to chess sets. A new low-cost 3D printer developed by Michigan Technological University's Joshua Pearce and his team could add hammers to that list. The detailed plans, software and firmware are all freely available and open-source, meaning anyone can use them to make their own metal 3D printer. Pearce is the first to admit that his new printer is a work in progress. So far, the products he and his team have produced are no more intricate than a sprocket. But that's because the technology is so raw. "Similar to the incredible churn in innovation witnessed with open-sourcing of the first RepRap plastic 3D printers, I anticipate rapid progress when the maker community gets their hands on it," says Pearce, an associate professor of materials science and engineering/electrical and computer engineering. "Within a month, somebody will make one that's better than ours, I guarantee it." Using under $1,500 worth of materials, including a small commercial MIG welder and an open-source microcontroller, Pearce's team built a 3D metal printer than can lay down thin layers of steel to form complex geometric objects. Commercial metal printers are available, but they cost over half a million dollars. 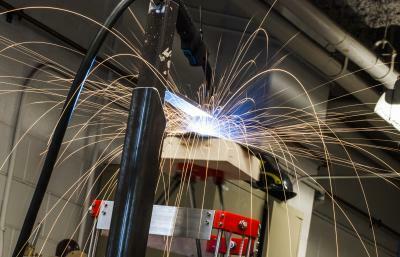 This is Michigan Tech's open-source 3-D metal printer in action. In particular, expanded 3D printing would benefit people in the developing world, who have limited access to manufactured goods, and researchers, who can radically cut costs of scientific equipment to further their science, Pearce said. "Small and medium-sized enterprises would be able to build parts and equipment quickly and easily using downloadable, free and open-source designs, which could revolutionize the economy for the benefit of the many." "I really don't know if we are mature enough to handle it," he added cautiously, "but I think that with open-source approach, we are within reach of a Star Trek-like, post-scarcity society, in which 'replicators' can create a vast array of objects on demand, resulting in wealth for everyone at very little cost. Pretty soon, we'll be able to make almost anything." The work is described in "A Low-Cost, Open-Source Metal 3-D Printer," to be published Nov. 25 in IEEE Access (DOI: 10.1109/ACCESS.2013.2293018). The coauthors in the Michigan Tech Open Sustainability Lab are Gerald C. Anzalone, a lab supervisor and research scientist in Michigan Tech's Department of Materials Science and Engineering; Chenlong Zhang and Bas Wijnen, PhD candidates in materials science and engineering at Michigan Tech; Paul Sanders, an assistant professor of materials science and engineering; and Pearce.